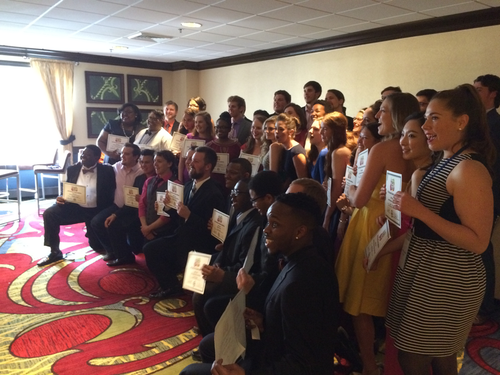 CHICAGO – The finals of the 2016 National Student Auditions were held as part of the 54th NATS National Conference on Sunday afternoon at the Marriott Magnificent Mile. Winners were selected in 15 categories, along with second and third-place finishers, resulting in more than $35,000 in prizes being awarded. This marked the third year for national semifinal and final rounds. As a result, nearly $100,000 in prizes have been awarded to students of NATS teachers. Also added this year was the Hall Johnson Spiritual Category. The purpose of this category is to restore authenticity to the performance of the classically-arranged Spiritual, one of America’s unique contributions to world culture. The competition wishes to encourage high excellence in the performance of this genre, and to this end, the Hall Johnson Estate will provide a cash award of $2,000 for the best performance of a Hall Johnson Spiritual at the biennial national convention from 2016–2036.